And now as the shock and adrenaline wears off, the grim reality. No new rescues since Wednesday. 103 officially dead, 228 still missing. The cost is estimated to be up to $16 billion and the 4 avenues CBD look like it will have to be demolished. 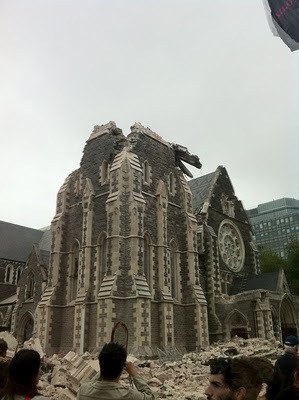 How does Christchurch, our second biggest city, come back from this? In the medium term, the psychological impact alone would have many deciding that this is the moment to leave Christchurch for good, NZ has to prepare for what may be one of our largest internal exoduses, how can the rest of the country deal with such population pressures? The economy which was in a double dip recession last year will take an even bigger hit as our second largest city has it's economy grind to a halt coupled with the massive cost alongside the losses. This earthquake that has cost our dear city of Christchurch so terribly has ramifications that will resound deeply around our country in a way unlike any other moment has. Our concept as to who we are as a nation has previously been forged on beaches in war far from our shores, or projected on rugby fields of sporting glory. Now in our darkest hour our humble resilience and solidarity in the face of such disaster is our new binding spirit and national identity. Kia Kaha beautiful NZ, Kia Kaha. Speaking as a resident of Chch - Unfortunately this earthquake is going to divert the public's attention away from some of the evils that the Key government would like to impose on us if they are re-elected: welfare "reform", reducing worker's rights, sale of state assets, moving further towards a police state, the rich getting richer while the poor get poorer with even the "middle class" becoming the working poor. This disaster has given the Key govt an opportunity to show a "caring" facade while stabbing New Zealanders in the back at the same time. It's comforting to know that the entire country is greiving with us, and for us. I, personally, apprciate the messages of support I continue to receive on a daily basis from friends far and wide. Keep Chch in your thoughts, knowing that this affects everyone, and not just my city. And after we've 'cleaned up' an important question to be asked must surely be "Rebuild what, and what should it look like?" I'm astounded when I hear people (mostly men) boldy stating, before the dust has settled and the people have been pulled from the rubble - that "Christchurch will rebuild." If I was a home owner there, I'd be weighing up my options, and some of them would include leaving town - and getting off the fault line. This is likely to affect the future of the city. Surely when we say we are going to rebuild, that begs the question: "Rebuild what, and what should it look like?" The old systems are crumbling it's time to rebuild, but let's seize the moment and imagine something more resilient, more human, based in systems thinking, ecological wisdom and social justice. So after we've calmed our nerves and taken a deep breath, which for some will require a move away from the shaking, maybe we can begin the conversation. First though, lets make sure everyone is being cared for, and that means physically, mentally and emotionally. There's a long and distinguished tradition of cities rebuilding after devastating disasters - in the modern sense it goes back to Sir Christopher Wren's redesign of London after the Great Fire. As http://ind.pn/aikLYJ from the (UK) Independent points out, it can be an opportunity for renewal. Jeez great time to sell in auckland, plenty of people will be looking for new homes. As the sad side effect the building industry will be doing well down there. Any comment must be prefaced by the sympathy for those many who are suffering and will as a result of the event. Spare a nanosecond to imagine how different this would be if it happened to Auckland.....just sayin'-maybe its a good time to re-evaluate ones' world view-these Cantabrians will make it due to the humanity shown by so many people-not because they had the latest i-pad or more money,better job....these things become insignificant in the face of such a disaster-Aucklanders would do well to ponder on this. New Zealand has been dealt a great blow, but one from which it must recover. If we are willing to see the reality of the situation, there is nothing to say that we shouldn't recover. Is it the whole of New Zealand that fear for the safety of new buildings? No. Our geography is ancient, yet breathes life and spurts growth from its every corner. We can not change nature. Nature we must learn from, and treat with respect. It is what we depend on to survive. I think it will survive. But I expect it will be greatly different. The population will surely shrink in the next two years as people begin to struggle to cope with the harsh realities of the disaster. Destroyed homes and businesses, empty streets and schools. Infrastructure which people have become so dependent on will be a pain to live without. Jobs and a new life beckon in other cities. Wellington, Auckland, Sydney, Brisbane, Perth. Our small world brings opportunities closer. The quake of February 22 has destroyed a huge amount of jobs and business in Canterbury. With the unemployment level rising steeply, losing some residents to Australia might not be such a bad thing. Those that cross the ditch will likely be qualified or educated, however this will ease some of the strain of unemployment on the economy. What New Zealand needs to do is start building the new motor for it's economy. We have the fuel of our natural resources, but we lack the meachnical nous of other countries. In a world where we are forced to compete, this earthquake may help to re-focus our economy. The past years have seen many people training in skills that really aren't needed or valuable, only ending up with a large student loan debt. Now we have a chance to re-train people into jobs which are required. Time to put our thinking caps on New Zealand. Where do we start building? Where in New Zealand makes sense? Something must come of this.